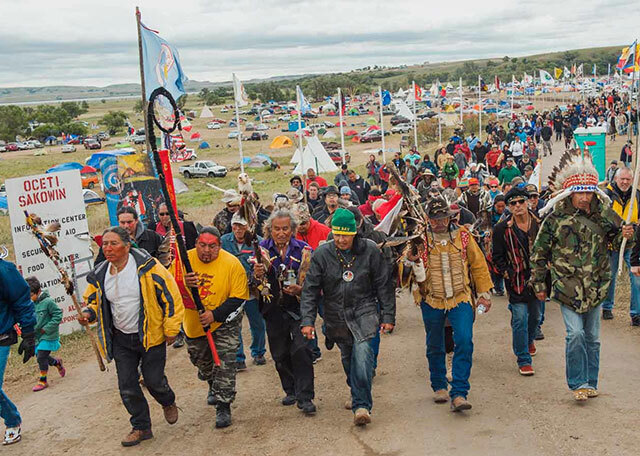 In the struggle over the Dakota Access Pipeline, the reformist left as usual has tailed along after the environmental groups who are opposed to any pipeline, and in the more extreme cases opposed to using oil or fossil fuels at all. On the other hand, the centrist Spartacist League (SL), in a knee-jerk reaction to the environmentalists, ends up echoing the line of some of the most retrograde, chauvinist sectors of the bourgeoisie. While calling to “Defend Native American Protesters” against state repression, the SL denies that the protesters had any legitimate reason to protest in the first place. They entirely disappear the blatant environmental racism, and argue that the native people have no legal right to control what happens on the pipeline route. The SL writes that, “As Marxists, we neither oppose nor support the DAPL.” Certainly pipelines in themselves are not inherently bad or good, but this is a subterfuge in order to refuse to oppose the DAPL route at Standing Rock. As Marxists, we defend the oppressed native peoples against this racist capitalist attack. Contrary to the straw-man argument of the SL, the Standing Rock Sioux Tribe is specifically opposing pipeline river crossing next to their reservation (as one can readily verify from its court suit against the U.S. Army Corps of Engineers and various tribal statements). The SL’s skewed portrayal of the fight is a smokescreen to hide anti-Marxist indifference to the fate of the Standing Rock Sioux. So say Energy Transfer Partners and the Spartacist League. But the land north of the reservation was stolen from the Standing Rock Sioux. When an SL supporter wrote in questioning this assertion, WV’s response was to double down on the claim that no Indian land rights were violated. 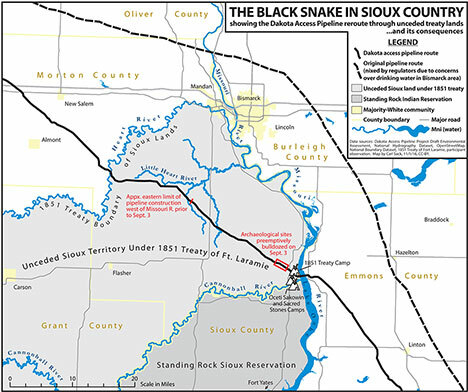 It concedes that “The 1851 Treaty of Fort Laramie recognized the Heart tributary of the Missouri River as the northern boundary of Sioux territory.” However, “The current border of the Standing Rock reservation lies roughly 30 miles farther south, along Cedar Creek and the Cannonball River.” To be sure, “The Sioux are owed substantial compensation for the theft of the land,” but nevertheless the DAPL “crosses land that has not been Sioux territory for almost 150 years and is inhabited by other people” (“On Standing Rock and Land Theft,” Workers Vanguard, 16 December). So according to these ex-Trotskyist apologists for the status quo, what’s done is done and can’t be undone – but give them a payoff as a consolation prize. There are so many things wrong with this, it’s hard to know where to start. To begin with, the SL dismisses concerns about possible oil spills contaminating reservation water supplies, saying: “it does not appear that this pipeline is any less safe than others of modern design.” As if modern pipelines don’t spill! Pipelines are indeed safer than rail transport of oil, but even so there were 1,739 significant pipeline incidents from 2010 to 2015. In fact, Sunoco Logistics, which is slated to operate the DAPL, has the worst spill record of any company in the U.S., with 200 incidents since 2010. And what happens if the DAPL does rupture? Will Indian families be removed, as the government has done with other victims of environmental disasters, like at Love Canal in Niagara Falls, New York in the 1970s. Moved where? This is the land of the Standing Rock Sioux, they’ve been pushed around for centuries and have nowhere else to go. Map by Carl Sack, cartographer at the University of Wisconsin, showing the lands crossed by the Dakota Access Pipeline which were guaranteed to the Sioux in the 1851 Fort Laramie Treaty and then removed in the 1868 treaty. 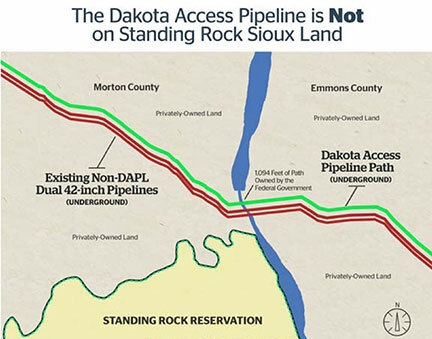 As for the assertion that the land crossed by the pipeline “has not been Sioux territory for almost 150 years and is inhabited by other people,” this is a preposterous objection. The area between the Cannonball River and Cedar Creek is sparsely populated, inhabited only by a few hundred people (2 per square mile). And even if the entire area in North Dakota belonging to the Sioux under the 1851 Fort Laramie Treaty were returned, which they have not demanded but would have every right to, who says the present residents would have to move? Then there are the treaties. 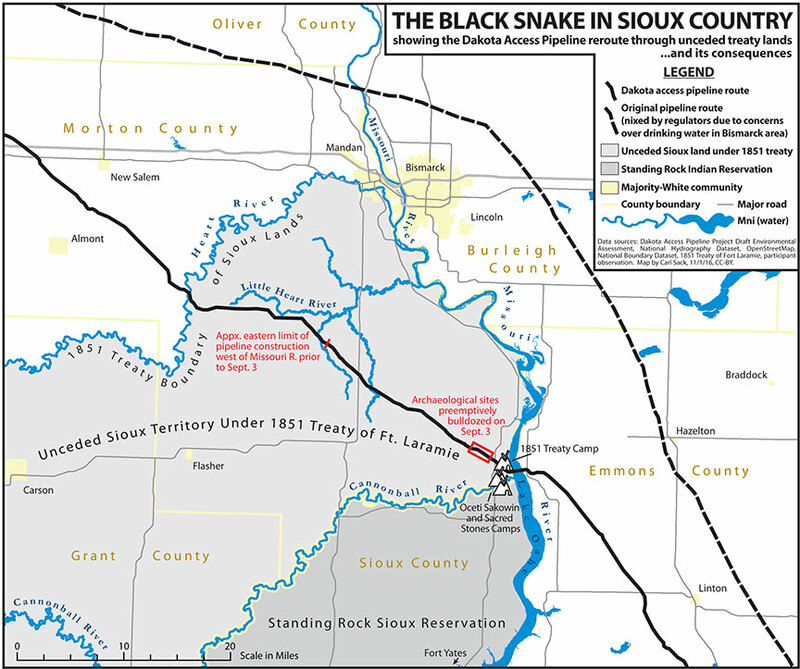 Even under Article 16 of the 1868 Fort Laramie robber-treaty unjustly imposed on the Sioux, and never ratified by them as required, the land north of the Cannonball River traversed by the pipeline is “unceded Indian territory” on which they continued to have use rights and on which white settlement was banned. The whole hair-splitting, logic-chopping argumentation by the SL as to why the Standing Rock Sioux Tribe does not have the right to block a pipeline a stone’s throw from their present residence, on land that is historically Indian country, stolen from them by the rapacious capitalist government, is a specious lawyer’s argument. The Spartacist line reflects the mentality of land surveyors for the bourgeoisie. The Corps of Engineers July 25 “Mitigated Fining of No Significant Impact” states that the entry point for crossing Lake Oahe is “approximately 0.55 mile north of the northern boundary of the Standing Rock Sioux Reservation.” So the fact that the DAPL is slated to cross the Missouri at a latitude of N 46 26' 14" instead of N 46 25' 42", according to the U.S. Army Corps of Engineers, Energy Transfer Partners and the Spartacist League, means the Standing Rock Sioux Tribe does not have the right to veto it! As a point of reference, if the SL has difficulty visualizing it, that is less than the distance between Washington Square and Union Square in Lower Manhattan. The potential for a serious environmental incident at this point is dismissed with a wave of the hand by these lawyers and unlicensed surveyors. Consider that a natural gas pipeline (the Northern Border line) and an overhead high-tension power line cross Lake Oahe at precisely the same point. Energy Transfer Partners uses this to argue what’s to worry, it’s already an infrastructure corridor. But what if an explosion of the gas pipeline were to rupture the oil pipeline, at most a few dozen feet away (and at points much less)? Impossible? When the pipeline was slated to cross the Missouri ten miles north of the state capital, Bismarck, concerns about possible water contamination got the route changed. The only reason this is not considered sufficient reason to stop the pipeline at Standing Rock is that these are Indian lands – i.e., not a “high consequence area.” But it has had consequences. Faced with environmental racism to bolster oil company profits, here we have an ostensibly revolutionary organization providing lawyer’s arguments. This comes on the heels of the new-found arguments of the SL’s misnamed International Communist League against the right to asylum for refugees, and against the right to free movement for immigrants inside the European Union. Why, that would mean “open borders,” the ICL gasps, sounding for all the world like Donald Trump railing against Hillary Clinton (as he did in their third debate). The SL/ICL doesn’t “get involved in which country immigrants and asylum seekers are sent to,” it says (see “Strange Encounters with the ICL,” The Internationalist No. 44, Summer 2016). So with tens of thousands of Syrian refugees being held in inhuman conditions in internment camps, the ICL raises these specious arguments to refuse to demand they be let in. 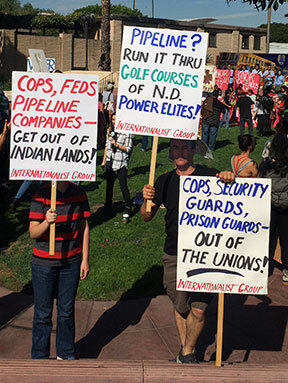 On Standing Rock, it argues that because “we do not counsel the capitalist ruling class on the most effective way to run its economy,” therefore it does not oppose a potentially dangerous pipeline being built right next to an Indian reservation. Recognizing that “many Indian protesters have argued that the pipeline infringes on what they consider to be sacred, ancestral land” from which they were expelled, Workers Vanguard(23 September) responds: “Of course one understands the resentment toward that displacement.” But of course. In the same vein, an ICL leader said of refugees clamoring at Europe’s doors, “We sympathize with their plight.” What is one to make of such Bill Clinton-like “I feel your pain” nostrums when the SL/ICL can’t bring itself to oppose a pipeline at Standing Rock, even as the Sioux residents and Native Americans around the country are protesting it? Of what value are its assurances that a future workers government would “ensure the social emancipation of American Indians, promoting their voluntary integration on the basis of full equality while providing the fullest possible regional autonomy for those who desire it,” when it parrots the propaganda of the bourgeoisie in the present battle, the biggest fight for Indian rights in ages?